We welcome a full range of volunteers of all educational and experience backgrounds. Volunteers are dedicated to helping us to achieve our mission of high-quality legal services for low-income individuals and families throughout the Bay Area. Volunteer opportunities are available during standard business hours (Monday-Friday 9am – 5pm). To assure a mutually beneficial opportunity, we generally seek a minimum of 8-12 hours/week and a three month minimum commitment. Depending on prior experience and time commitment, volunteers have the opportunity to work with front line staff to become familiar with the law firm and community needs, as well as work directly with staff and clients on ongoing cases and projects. Staff and volunteers assist self represented litigants with the paperwork needed to receive a Temporary Restraining Order. 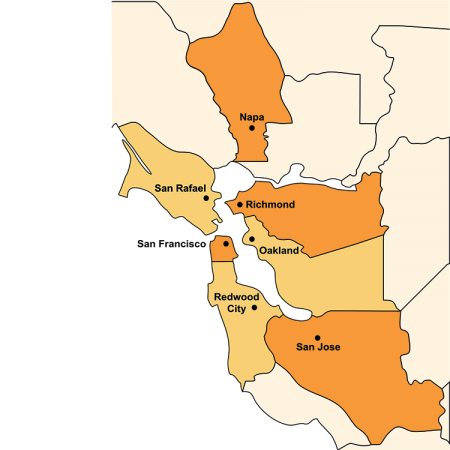 BayLegal conducts Clinics in Redwood City, throughout Contra Costa County, and is a partner in San Francisco’s Cooperative Restraining Order Clinic (CROC). BayLegal staff and volunteers assist self-represented litigants in limited civil debt collection matters. Clinics are offered weekly in Bay Point, Fremont, Redwood City, Richmond, Napa, and San José. Volunteers fluent in a language other than English, can assist BayLegal in our mission to provide high quality legal services to low-income people regardless of their location, language or disability. Volunteers generally work along side of our staff or volunteer attorneys assisting clients with a range of civil legal needs. This volunteer position is flexible and generally contacted on an as-needed basis to assist with particular cases or projects. Assist BayLegal attorneys and volunteers with expert assessments needed within a case (ex. business or property evaluation; computer forensics; etc). Please complete Volunteer Application and submit with a copy of your resume.